This issue picks up almost immediately from where the first one left off and we see that Kichiro’s warnings fall on deaf ears. He was in the right place at the wrong time and now he is paying for the confluence of fate that brought him up against the menace that has come to terrorize Japan and is looking to destroy the Shogun as an opening gambit. The series so far reads like an action movie, with a slight dose of romance and it is proving to be quite a refreshing read from the usual vampire fare since Levin is keeping the blood-drinkers in the realm of the mysterious and is not overplaying them. However, this can also work against in that we don’t really know why the vampires are in Feudal Japan. All we know is that these Vampires are pirates and that some of them are responsible for Kichiro ending up here in the first place, as we saw in the opening pages of the first issue. Still, its really interesting the kind of effect that they are having in the country. Using assassination techniques, they are creating discord in the highest levels of government, and to great effect as well. Kichiro is struggling to make his warnings be heard, but is having a run of rotten luck at it, which goes on to create more sympathy for the character. And where the characters are concerned, Levin stays true to the portrayal that he introduced in the first issue. There is consistency here and while this can be somewhat predictable, it does create some great tension in the narrative since the story is going along certain lines and the tense anticipation is there in plenty. The pacing issues from before still exist here. In fact, they are slightly more pronounced since the issue this time covers a much larger time-frame in present than the first issue did. Events simply move too quickly and it left me somewhat disoriented since there were leaps in the narrative that essentially skip on plot and character development. Still, ultimately the bottom line is that Levin manages to write a pretty fun comic, even if it is only a screenplay adaptation for the comics medium. I’m enjoying the series despite its flaws. With the art, it was slightly better this time around. There is a lot more action going on this time and Jessada Sutthi’s art style lends itself well to such panels. The action sequences are always clear, and they stand out. Its not easy to capture the samurai style of swordfighting in comic form since as a series of (somewhat) disconnected images the full effect is lacking, but Jessada Sutthi nevertheless rises to the occasion and he gives it his best, which I can both appreciate and respect. And he even mixes up Kichiro and Orochi’s action scenes considerably so that the action never gets stale. Another feather in his cap. So far, I’m really liking where this series is going. If the few kinks can be ironed out, all the better. 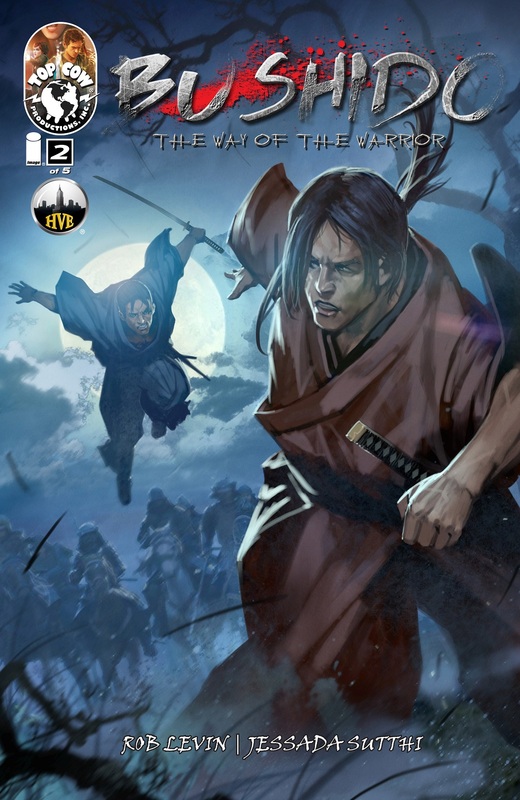 Posted on October 15, 2013, in Comics Reviews, Review Central and tagged Bushido, Comics, Comics Reviews, Feudal Japan, Heroes and Villains Entertainment, Image Comics, Jessada Sutthi, Review, Review Central, Rob Levin, Samurai, Studio HIVE, Top Cow, Top Cow Comics, Troy Peteri, Vampires. Bookmark the permalink. 3 Comments.